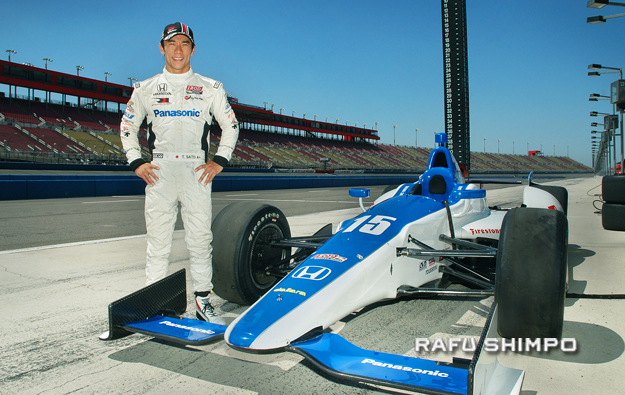 After coming tantalizingly close in May to winning the crown jewel of American Formula One racing – the Indianapolis 500 – only to lose it on the final lap, Sato is embracing the challenge of Saturday’s MAVTV IndyCar World Championship at the Auto Club Speedway. The two-mile, oval-shaped course will see the return of IndyCar for the first time since 2005, and there are inherent challenges to the course built on the desert floor not far from the San Andreas Fault. Add the fact that temperatures are expected to be in the triple digits on Saturday, and Sato’s team has quite a challenge, indeed. Sato, currently 16th in the IndyCar points standings with 255 points, said the learning curve and learning the curves has proven a more daunting task than his team had expected, but the final race of the season is a long one and affords time for adjustments. Tom Anderson, managing director of race operations for Rahal Letterman Lanigan Racing, said toughness, combined with the length of the race, are factors that work in Sato’s favor. Anderson said that the team wasn’t as concerned about qualifying as much as the challenge of controlling the course, with its relatively sharp turns. The Auto Club Speedway has helped to make Sato feel at home, even creating a sandwich in his honor to be sold at Saturday’s race. “As bumpy as the track is, I think mentally, it’s going to be tough. Concentration is really key,” added Sato, who predicted considerably slower speeds than were seen at Indianapolis. While he has moved on, the memory of that race in May still drew a pause from the 35-year-old from Tokyo. 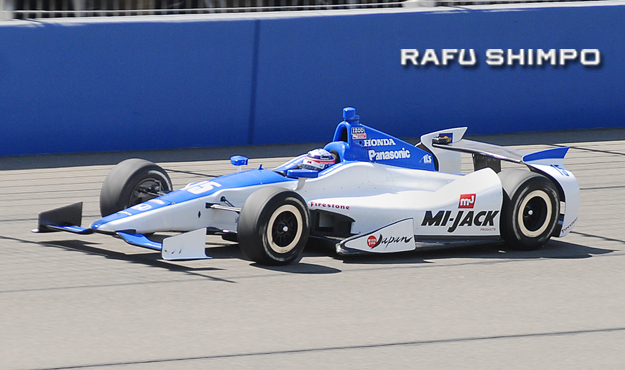 Heading into the final lap, Sato had what many felt was a clear inside lane to pass leader Dario Franchitti. However, Franchitti held his ground, forcing Sato to drive across the apron, causing him to lose control and crash into the wall. Some felt the stand by Franchitti constituted a block, which is against IndyCar rules, but the official decision let the result stand, giving the Scotsman the checkered flag and leaving Sato – unable to finish due to the damage from the crash – with a 17th-place finish. “In some ways, the reaction and support from fans all over the world was a good feeling,” Sato said of the incident. “Even at the airport, I was feeling down and many fans showed up. We had to go to Windsor, Ontario, and even at the border, some of the inspection people asked about me. Coming into Fontana, Sato said it’s a different environment and he and his team have an approach unique to this particular race. An added welcome for Sato is the addition of a menu item in his honor, that will be available at the concession stands for Saturday’s race. While in Indianapolis, he became quite fond of pork chop sandwiches. Fontana will offer the Takuma Sato sandwich – a pork chop with barbecue sauce and wasabi slaw. Sato, above driving during his first test runs in Fontana on Aug. 21, said the 500-mile race leaves a good deal of time for adjusting to the unfamiliar and bumpy track. While he had not yet seen it, Sato was touched by the gesture. “I’m looking forward to that, because the league has done a lot to make this special. It’s a real pleasure to have a menu with something I really loved in Indianapolis,” he said. Sato is somewhat of an anomaly in auto racing, growing up without much exposure to the sport and entering at a relatively late age. He is also one of the few drivers from Japan with very little experience in his homeland. He credits the challenge and simple determination as his motivation to pursue a career behind the wheel. At the ripe old age of 20, Sato was accepted by the Honda-managed Suzuka Circuit Racing School, where he admitted he struggled at first. After two years, he began to show marked improvement, and in 1998, moved to England to hone his skills on the European circuit. there, he lived with an English family, studying English during the week and kart racing on weekends. In less than two years, he moved up to British Formula Three, winning the championship in 2001. “In that two years, I learned so much; not only English, but the skills of racing and how to approach racing internationally, communicating with people in racing, setting up the car, everything,” Sato explained. Sato drove in European Formula One beginning in 2002, leaving to sign with IndyCar in 2010. He said the challenge of Fontana is simply his latest, and that his motto of “No attack, no chance” holds as true as ever. The MAVTV 500 IndyCar World Championship will be held Saturday at the Auto Club Speedway in Fontana. A special Takuma Sato ticket package, which includes a pit pass and a question/answer session with Sato, is available by calling (800) 944-7223, or by visiting www.autoclubspeedway.com/sato.